As your business embraces social media, you will likely include social media advertising in your plan. It can be scary to move from an organic social strategy to putting real money on the table, so it’s important to understand all the options. In this guide, we explain how to use the various types of social media ads to achieve real business results while maximizing your spend. The major social networks offer advertising options—but not all will be a great fit for every marketer. When thinking about which social networks to use for advertising, look at which ones are performing well organically. Networks where your content naturally strikes a chord with fans are an obvious choice for your first social ad campaigns. When choosing where to place your ads, it’s also helpful to know which networks are most popular among which types of users. For example, Pinterest has far more female than male users, and Snapchat has massive penetration in the younger audience segments. Here’s a quick summary from the Pew Research Center showing who’s using which social networks in 2018. Now that you have a sense of which social networks are a demographic fit for your business, let’s look at the types of ads each network has to offer. Facebook ads are designed to help you achieve one of three broad types of campaign objectives: awareness, consideration, or conversion. Audience considerations: Facebook is popular across demographics and offers detailed targeting options, making it a great platform to get started with social media advertising. You have several ad formats to choose from. In addition to a photo, Facebook photo ads include 125 characters of text plus a headline and link description. They can also include a call-to-action button like Shop Now or Send Message. You can create your photo ad in Facebook Business Manager, or simply promote a post with an image from your Facebook Page. Quick tip: Facebook photo ads work really well for showcasing new products or services. Show people using your product, rather than a simple photo of the product itself. Facebook video ad options range from short mobile video ads up to 240-minute promoted videos designed to be watched on desktop. With so many options, it’s critical to have solid goals and understand who your target market is and where your video will reach them. Facebook video ads can work well in conjunction with a TV ad campaign. Even if TV is not part of your marketing mix, video ads can be a great way of drawing people in with compelling visuals that highlight the best parts of your brand. 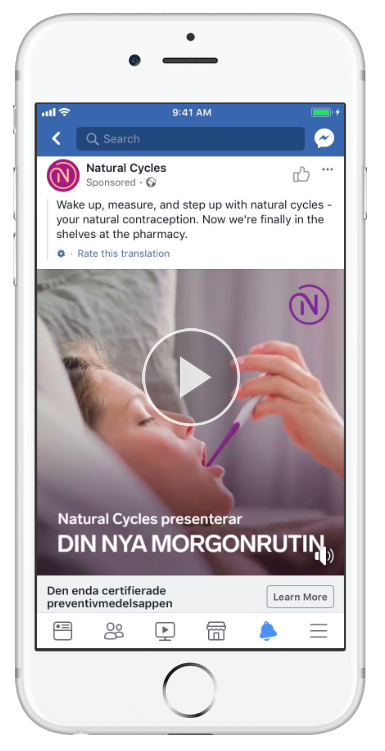 For example, the contraceptive app Natural Cycles adapted a TV ad to run on Facebook in Sweden. They made the video vertical to maximize screen space on mobile, and added text to optimize the video to play without sound. The campaign had a 20 percent incremental reach beyond the TV campaign, reaching one million women. Quick tip: Short videos have higher completion rates. Stick to 15 seconds or less if you’re placing videos in the mobile feed. A carousel ad lets you include up to 10 images or videos, each with their own link, all in one ad. Carousel ads work well to showcase different features of a product, or to explain a step-by-step process. They’re also a great way to present multiple products. Quick tip: Use the different elements in your carousel ad together to present a compelling, effective story or message. Here are a couple of creative examples. A slideshow is an ad that creates a video from several static images—your own or stock images that Facebook provides. Slideshows offer the compelling motion of video, but require no video-specific resources to create. If you’re not ready to try video ads but want to move beyond static photos, slideshow ads are a great option. This slideshow ad for Iceland Air highlights several of Iceland’s top sights, along with Iceland Air branding, to create excitement about travelling to the country with its national airline. Grijp je tickets, ga aan boord en trakteer jezelf op een onvergetelijk avontuur met Icelandair. Quick tip: Slideshow ads load fast even on slow connection speeds, so they can be a particularly great alternative to video if your target market is likely to access Facebook from a slow connection. A collection ad highlights your products right in the Facebook feed. The ad includes a cover photo or video plus product images with pricing and other details, and allows people to learn more about your product without leaving Facebook. 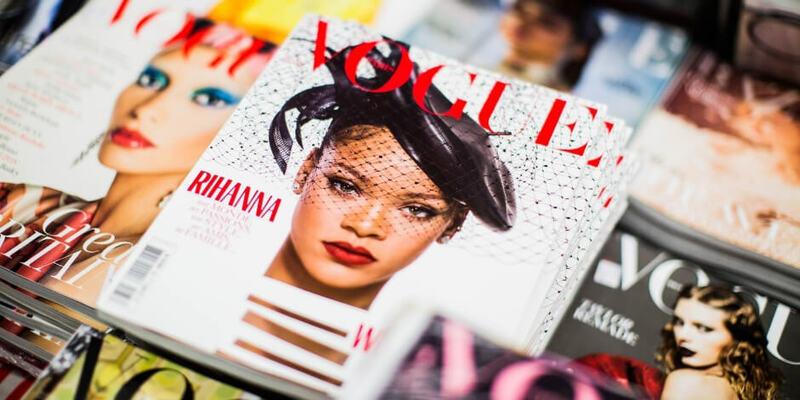 Quick tip: Collection ads work especially well for retail and travel brands. 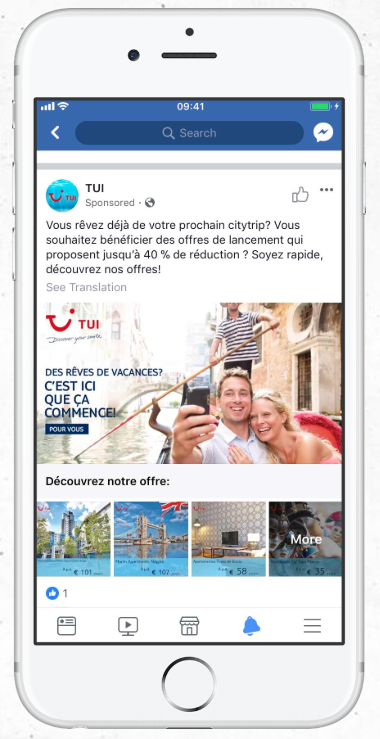 For example, tour operator TUI Belgium achieved a three times greater click-through rate with collection ads compared to link ads on Facebook. 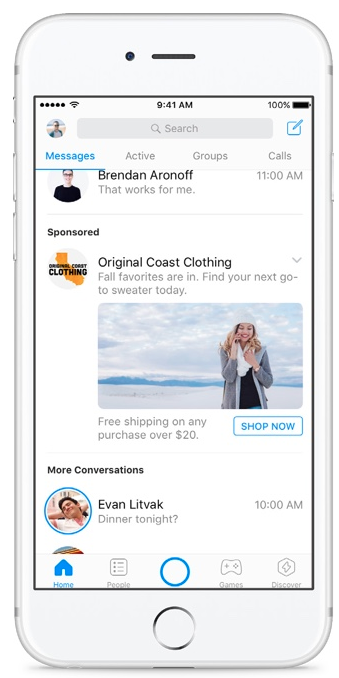 Messenger ads are simply Facebook ads placed on the home screen of the Messenger app. You can use them to encourage people to connect with your business on Messenger, but they can also link to your site. Quick tip: Using a custom audience of people who have previously messaged your business, you can use Messenger ads to restart conversations that have trailed off. Facebook lead ads are mobile-only that include pre-populated contact forms. This makes it easy for people to sign up for your newsletter, request a free trial, or ask for a quote.They’re a great tool if you’re looking for leads to pass along to your sales team, or to build your online sales funnel. Quick tip: Ask for the minimum amount of information you need to process leads effectively, to maximize completion. Get all the step-by-step instructions you need to set up your Facebook ads in our Facebook advertising guide. Since Facebook owns Instagram, it’s not surprising that Instagram ads support the same three broad categories of campaign objectives as Facebook ads: awareness, consideration, and conversion. 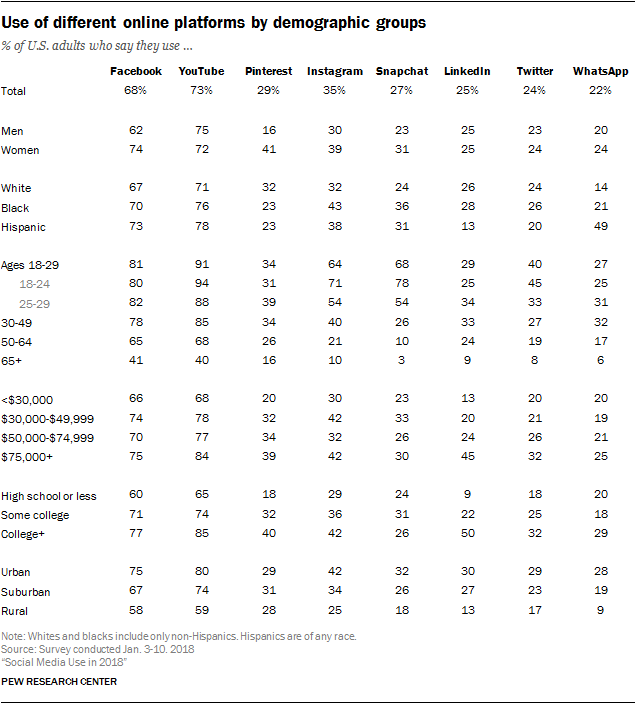 Audience considerations: Instagram is most popular with millennials, but plenty of Generation Xers also use the platform. The specific Instagram ad types also mirror three of the Facebook ads types: photo, video, and carousel. You can create each type of ad for either the main Instagram feed, or for Instagram Stories. Your Instagram photo or video will look like a regular Instagram post—except that it will say Sponsored in the top right. Depending on your campaign objective, you may also be able to add a call-to-action button. Quick tip: Make sure your photo and video ads are consistent in style with the organic posts you share on Instagram so that viewers recognize the ad is from your brand. Videos autoplay with sound off, so optimize your videos to work without audio. Here’s a great example of a brand-consistent video with no sound required. Perrier used this video in an Instagram campaign. A study after the campaign showed the ads contributed to increasing offline sales. In an Instagram carousel ad, viewers tap the arrows or swipe to scroll through different images. Quick tip: Make sure the images you use in your carousel ad are visually similar and tied together by a common theme. It shouldn’t be jarring to swipe between the different photos in the ad. Instagram Stories ads can use photos or videos up to 15 seconds long. These ads display in full-screen format between people’s stories. Quick tip: Instagram Stories only last for 24 hours, so this is a great format for in-the-moment marketing like limited time offers. Ads that show the product in use perform best. For example, Michael Kors used Stories ads to show off its smartwatch and achieved a 24-point lift in ad recall and 8.8 point lift in favorability. Get all the step-by-step instructions you need to set up your Instagram ads in our Instagram advertising guide. Website clicks or conversions: Promote Tweets to people who you want to visit and take action on your website. You’re charged per click. Tweet engagement: Promote Tweets with the goal of starting conversations about your brand. You pay for the initial engagement. Gain followers: Promote your Twitter account and pay per follower gained. Increase brand awareness: Promote your Tweets to a broad audience and pay for impressions (CPM). Video views: Promote your videos to a targeted audience and pay per video view. App installs or re-engagement: Promote your Tweets and pay per click to open or install your app. Audience considerations: Twitter is big outside of the USA and Canada—there’s major growth happening in India, and Brazil, Japan, and Mexico are all big markets. Twitter offers two ways for brands to create Twitter ads: Twitter Promote, which automatically promotes Tweets for you, and Twitter Ads campaigns, in which you set up campaigns yourself based on your marketing objective. When you enable Twitter Promote, the Twitter algorithm automatically promotes your first 10 daily organic Tweets to your specified audience (as long as they pass the Twitter quality filter), and promotes your account to attract new followers. You can focus on up to five interests or metro locations, and let Twitter do the rest. Quick tip: Twitter Promote mode costs $99 USD per month, and Twitter says accounts will on average reach 30,000 additional people per month and gain an average of 30 new followers. When you set up your own Twitter ad campaigns, you start by choosing your business objective, which ensures your ads align with your business goals. For example, the driver’s ed app Aceable used Twitter app install ads to promote their solution specifically to people who had been talking about driver’s ed on Twitter. You can select existing organic Tweets to promote, or create Tweets specifically as ads. Quick tip: Run separate campaigns for mobile and desktop users to get the best conversion rates. Twitter recommends you avoid using hashtags and @ mentions in your ads so that your audience does not click away. Get all the step-by-step instructions you need to set up your Twitter ads in our Twitter advertising guide. Audience considerations: Snapchat is overwhelmingly popularly with younger users: 78 percent of 18-to-24-years olds use the app, compared to only 26 percent of 30-to-49-year-olds. Snapchat offers three types of advertising tools to help you meet your objectives. With Ads Manager, you can create photo or video ad campaigns that appear between stories on the app. The ads are full-screen, vertical format, and can include attachments for app installs, lead generation, video views, and website visits. Quick tip: Time moves quickly on Snapchat, so aim to keep your video ad to three to five seconds or less. Don’t try to do too much with a short ad: Feature one strong call-to-action and key message. 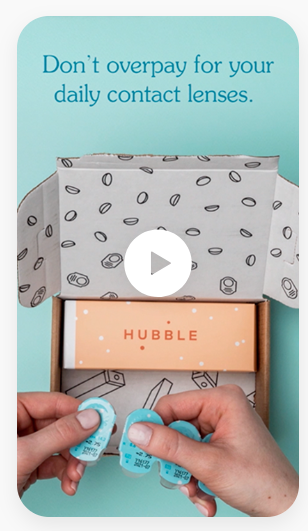 The contact lens company Hubble used this strategy to get new subscribers for its free two-week trial and saw 2.5 times subscriber growth. Snapchat filters are graphic overlays that users can apply to their Snaps—and Snapchatters use them on average three billion times per day. You can create them for a specific geofenced area near your business using the Snapchat create your own filter tool. Quick tip: Snapchatters use filters to provide context to their snaps, so make sure your filter is relevant to the time, place, and purpose of your campaign. Leave room for Snpachatters’ own images to shine—only use the top and/or bottom quarters of the screen for your filter creative. Snap Publisher is a do-it-yourself ad creation tool that lets you build your Snap ad from scratch from your browser. It’s a great resource for small businesses that don’t have a large marketing team, since the provided templates mean you don’t need graphic design skills, and you can create your ads in just a couple of minutes. Quick tip: Given the ease of use, this is a great first option if you’ve never advertised on Snapchat before. This ad format takes the form of a branded tile in users’ Discover feed. The tile leads to a collections of 3-20 Snaps, so advertisers can provide a deeper dive into new products, special offers, movie releases, etc. You can also add Attachments with a call-to-action, so that users can swipe up to watch a trailer, install an app, or buy a product. Quick tip: Create a curiosity gap for users by writing an enticing headline for your tile. Tease what they might learn or how they will benefit if they tap on your Story. Get all the step-by-step instructions you need to set up your Snapchat ads in our Snapchat advertising guide. Audience considerations: Marketers have rated LinkedIn as the best platform for B2B lead generation. As a professional networking site, LinkedIn is much more business-oriented than the other social networks in this post, and offers targeting options based on professional qualifications like job title and seniority. You can choose from several different types of LinkedIn ads. Sponsored Content ads appear in the news feed on both desktop and mobile. They’re used to get your content in front of a larger audience and showcase your brand expertise. Quick tip: Headlines under 150 characters have the best engagement, and larger images get higher click-through rates. LinkedIn recommends an image size of 1200 x 627 pixels. The customer service software company Aspect used Sponsored Content to promote its thought leadership articles. The campaign increased Company Page followers by 17 percent and referral traffic to the Aspect blog by four times. Sponsored InMail is similar to email marketing, except that the messages go directly to users’ LinkedIn inboxes. A unique feature of Sponsored InMail is that users only receive ad messages while they are active on LinkedIn—so messages don’t sit around getting stale. Quick tip: Short body text (under 500 characters) gets the highest click-through rate. The top five performing calls-to-action for Sponsored InMail are: Try, Free, Today, Click, and Apply, in that order. Text ads are small ad units that appear at the top and the right of the LinkedIn news feed. They only appear to desktop users, not on mobile devices. Despite the name, text ads can actually include a thumbnail image of 50 x 50 pixels. Quick tip: Show a human face—profile images work better than logos or pictures of objects. Get all the step-by-step instructions you need to set up your LinkedIn ads in our LinkedIn advertising guide. Audience considerations: Pinterest has significantly more female users than males. According to the Pew Research Center, 41 percent of U.S. women use Pinterest, compared to just 16 percent of U.S. men. Because people use Pinterest to save ideas, it’s a network that naturally leads to shopping and purchases, but those purchases may not happen right away. Pinterest ads are called Promoted Pins, and they look and behave just like regular pins—the only difference is that you pay to have them seen by a wider audience. Promoted Pins are identified as ads with a small “Promoted” tag. However, if users save your ads to their Pinterest boards, that promoted label disappears, earning you bonus organic (free) exposure. There are a couple of options for promoting your Pins. Using the ads manager, you begin by selecting a goal for your Pinterest ads campaign. This means you can target your advertising strategy to align with your business goals, including whether you pay per click or per impression. You also have the option to choose where your ads appear on the network: browse and/or search. Quick tip: Since Pinterest is used for planning and generating ideas, it has a longer lead time than some other social networks. Start running Pinterest ads tied to a seasonal or date-specific campaign about 45 days in advance. And try getting creative with the DIY nature of Pinterest as a social network. For example, the craft store Michaels has developed craft kits based on Pinterest trends. Michaels then promotes those kits on, you guessed it, Pinterest, using Promoted Pins. Pinterest claims you can use the promote button to create a Pinterest ad in only nine seconds. All you have to do is go to your profile, select the Pin that you want to promote, click the button, and set your daily budget. Promoted pins are always pay-per-click, so you only pay when someone clicks through to your website. Then, add some keywords, click Promote again, and your ad is up and running. Quick tip: This is a really easy way to get started with Pinterest advertising. Try promoting some of your best-performing Pins to get a sense of the kind of reach you can achieve with your desired budget. Make sure to track results over time to see the effects as people save your Promoted Pins to their own boards, which further expands your reach organically. Get all the step-by-step instructions you need to set up your Pinterest ads in our Pinterest advertising guide. Audience considerations: YouTube is the only social network used by more men than women. The difference is not huge: 75 percent of American men use YouTube, and 72 percent of American women. But this may be of interest if you’re specifically targeting a male audience. There are a couple of different video ad formats available on YouTube. Since Google owns YouTube, you’ll need a Google AdWords account to create YouTube ads. These ads automatically play before, during, or after other videos on YouTube. Users get the option to skip your ad after five seconds. The recommended video length is 12 seconds to three minutes. Quick tip: If you’re in the US or the UK, YouTube will send a professional filmmaker to shoot your 30-second ad if you commit to spending $350 on YouTube ads. These appear in YouTube search results, on the YouTube homepage, and next to related videos. Users have to click your ad to start watching the video. Quick tip: TrueView discovery ads auto-generate thumbnail images for your video ad. Since this image needs to compel people to click on your video, make sure it clearly shows off what your video has to offer. The mattress company Tuft & Needle uses YouTube video ads to highlight how they’re different from traditional mattress manufacturers. They target people searching for relevant keywords and dedicate half their Google ads budget to YouTube video because they’re so happy with the results. They keep their ads between 30 seconds and two minutes. Here’s one of the longer examples. These ads are a maximum of six seconds long. Like TrueView In-Stream ads, they play before, during, or after another video, but viewers cannot skip Bumper ads. Quick Tip: Don’t try to do too much in six seconds. Start with a strong visual, stick to one message, and leave enough time for your call to action. Get all the step-by-step instructions you need to set up your YouTube ads in our YouTube advertising guide. It’s no accident that we’ve started each section of this guide by reviewing the business objectives each type of social media advertising can help you achieve. As in all marketing strategies, it’s awfully hard to achieve your goals if you don’t know what your goals are in the first place. Understanding what business objective you’re trying to achieve with your ads is critical for ensuring you choose the right social network to advertise on, and the right advertising solution within that platform. It will also guide your creative strategy. We’ve listed some audience considerations for each of the social networks, but keep in mind that they all offer quite specific ad targeting. Knowing exactly who you’re trying to reach allows you to take maximum advantage of these targeting options and ensure you get the best bang for your advertising buck. After all, there’s no point in advertising to soccer moms in Florida if your audience is young male video gamers in New Jersey. This ability to micro-target your ad campaigns is one of the key benefits of social media advertising. Developing audience personas can help you understand exactly which audience segments you should focus on. You’re likely already posting content on Twitter, Facebook, and Instagram every day—and maybe LinkedIn and SnapChat, too. Some of these posts will resonate with followers; others won’t. Track which ones are being clicked, liked, shared, and commented on. These high-performing messages make the best candidates for social ads. If you’re branching out into a new network with your social media advertising, start small. Use what you’ve learned from your organic posts as a starting point, but know that those lessons will not necessarily translate across social networks. Keeping your social media advertising budget under control means thinking about whether you’re designing an ad campaign based on impressions or engagements. If you’re paying every time someone sees your ad (impressions), your message can cast a wide net. But if you’re paying for engagement, you only want people who are really interested in doing business with you to engage. Since you don’t want to pay for engagements that are not relevant to your business goals, the wording of your ad should help people identify whether it’s for them or not. Both engagement and impressions campaigns can be valuable for your business—you just need to choose the right one to align with your business goals so that you only pay for real business results. Here’s some more information about which metrics to track to make the most of your social ad campaign. Ninety percent of active monthly social media users access social networks through a mobile device. That means most social media ads are being viewed on mobile devices as well. Your mobile ads should be specifically designed for the small screen, incorporating images that are easy to view on a pocket-sized device. You can also take advantage of “geofencing” to target mobile users when they are in a specific zip code, so they only see your ads when they are close enough to walk in your front door. Testing one ad against another to determine what works best and refine your strategy is known as A/B testing. It’s a critical part of your social media advertising efforts, and we’ve got a full guide on how to do it right here: Social media A/B testing. Just as it’s important to know your goals before running an ad campaign, it’s important to measure results. This will let you know whether you’ve hit your targets, and show you what worked and what didn’t so that you can improve going forward. Measuring your results and having concrete data about the value your ads bring to the company (purchases, leads, and so on) is a key part of proving ROI. And if you can prove that your ads are paying off, that will ensure you get the budget you need to continue your work. The major social networks offer analytics to help you measure the results of ads. And we’ve created in-depth guides on how to use them for Facebook, Instagram, Twitter, LinkedIn, Snapchat, and Pinterest. You can also use tools like Google Analytics and Hootsuite Impact to measure results across networks from a single dashboard. Prove (and improve) your social media advertising skills by taking Hootsuite Academy’s industry-recognized Advanced Social Advertising course.